Prominent & Leading Manufacturer from Ahmedabad, we offer single beam overhead crane and double beam crane. Packaging Details: Electric & Small parts are packed by high quality wooden crate to reduce distortion in conveying; Main beams, end carriages and electric hoist are packed by Wrapping of plastic roll It can reduce abrasion when transport. 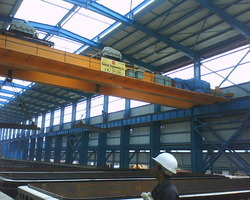 Looking for Beam Crane ?